When I planted the seeds, though, the Better Boy packet had 5-6 seeds in it. My cynical thinking was “these must be really good to pay for FIVE or SIX seeds as if there were 70 seeds!” Just didn’t seem right, so I came to my trusty Internet to see if I could find the seed company. 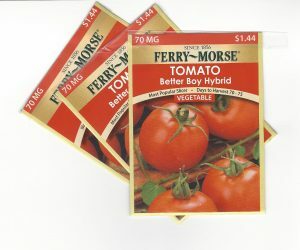 Sure enough, Plantation Products distributes Ferry Morse seeds. And there were some stinky reviews on Google. In what I hope will be respected as pretty darn good tenacity, I called the seed company — the phone number was right there by the stinky reviews. A very nice and well-spoken young woman listened to my plea and told me that NO, it wasn’t intentional to have only 5-6 seeds in my little red envelope. She said she would be happy to send me some more seeds if I would only give her my mailing address. Well, I was more than happy to do that. 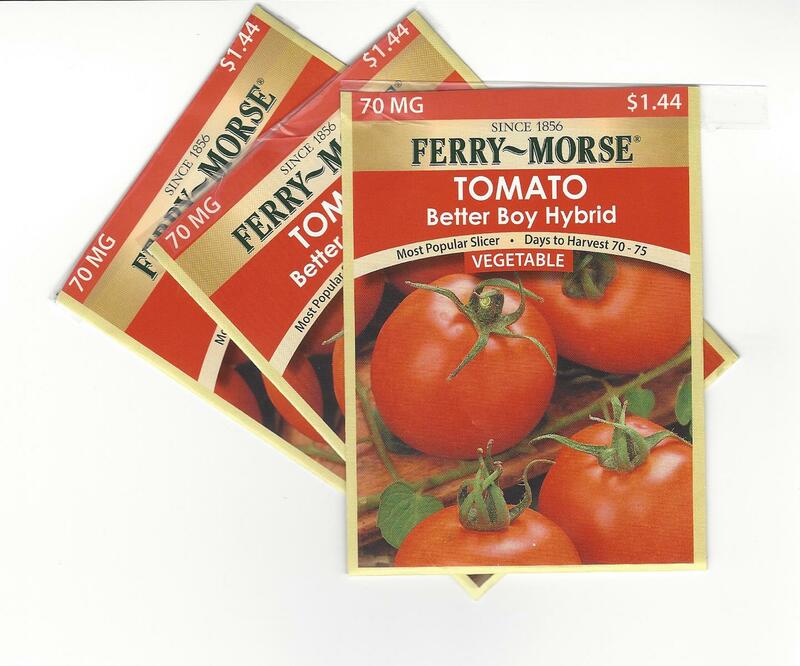 Today, less than a week later, a padded envelope arrived with THREE packets of Better Boy seeds. Now, it should all end warm and fuzzy here, but it sort of doesn’t. I thought those packets had VERY little rattle when I shook them and sure enough, there are probably close to the 70 mg of seeds in ALL THREE packets together. Now, this is a lot more than I had last week and as many as i paid for, so I’m not hurt a bit. I am wishing that the seed fairies will provide the people at Plantation Products and Ferry Morse seeds a new scale in the packaging system so they can possibly be more accurate. Until that happens, the next best thing I can offer is some seed shopping advice. Check the packages at the display in whatever store you choose before dropping them into the shopping cart and heading home. They may all be ‘short’ and you may decide to grow a different plant. Or you may decide to go with what you can get. That packet of 5-6 plants is still less expensive than started plants. And not a bad deal when you add the value of the therapy you gain from being at one with your little plants from the very beginning. My writing at The Legacy Gardens will frequently be exhibited at The Writer’s Well — a safe and encouraging place for writers.